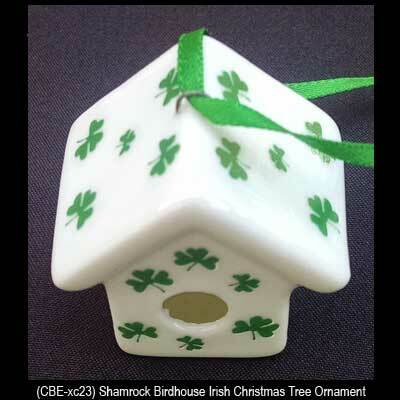 Shamrock Birdhouse Irish Christmas Tree Ornament. Dimensional Design, 1 1/2" Wide x 1 1/2" Tall x 1" Deep, One Entrance Hole. Green Shamrocks on White Porcelain, Shamrocks are on All Sides. Gift Boxed, Ready to Hang with Included Green Ribbon.